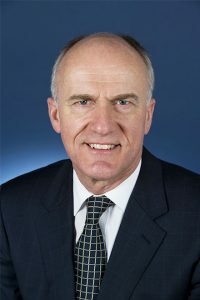 Senator Eric Abetz is an Australian politician and a member of the Australian Senate since February 1994, representing the state of Tasmania. Mr Abetz is a Christian and throughout his political career he has been associated with Focus on the Family, Lyons Forum, Endeavour Forum, Family Council of Victoria, Fatherhood Foundation, Australian Christian Lobby, Australian Family Association and Right to Life Australia. A farmer – until I realised I would need money to buy a farm. Then (I wanted to be) a teacher and finally decided on becoming a barrister and solicitor. Seeking to lead a life of service based on biblical principles – as a husband, father, community member and a parliamentarian – advocating for the Judeo-Christian worldview as the best foundation for a cohesive and well functioning society which allows the freedom for all to reach their full potential. Q: What are the key principles of Judeo-Christianity that make it the ideal ethical perspective to guide societyís behaviour? Every human is of equal value because we are made in God’s image. As such we have certain rights and obligations that cannot be infringed by government. It acknowledges the innate frailty of humanity whilst providing hope for the future and eternity. Servant leadership, individual responsibility, compassion, reward for effort, rehabilitation, paying a worker a fair wage, honesty, integrity, respect for each other are all biblical injunctions. Societies based on the Judeo-Christian ethic are the envy of the world. There is a reason for this. It’s the best. Q: Why is it so important to debate our religious beliefs? Everyone has “religion” or a worldview which informs one’s morality and in turn concepts of good and bad. Religion influences how we live our individual lives and societal codes. All people are impacted by the worldview underpinning their society and lives. It is therefore imperative to defend our Judeo-Christian beliefs because in the competition of worldviews there is no vacuum. If we don’t occupy the space some less worthy worldview will. Prayer should be a constant in our lives. Prayer should not be a “break (glass) (into prayer) in case of emergency” crutch which we hope we never have to use. Prayer should be a constant companion – especially when things are going seemingly well. Prayer is the avenue to give thanks when things are going well (to keep one humble) and the avenue to seek support when things are going not so well (to keep us strong). Q: What is your favourite beer?